Material is ten percent (10%) Service Disabled Veteran Owned Small Business Set Aside. Download "Material 100158 is ten percent (10%) Service Disabled Veteran Owned Small Business Set Aside." 1 United States Department of Agriculture Agricultural Marketing Service Commodity Procurement Staff 1400 Independence Avenue, S.W. 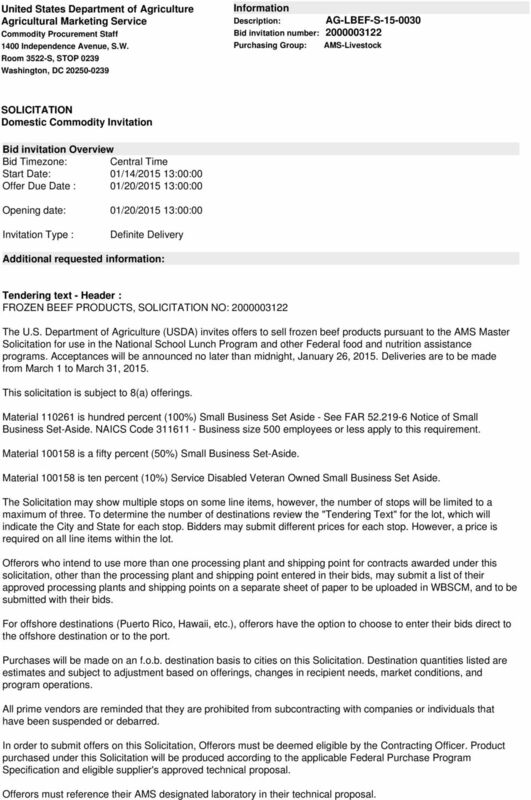 Room 3522-S, STOP 0239 Washington, DC Purchasing Group: AMS-Livestock Bid invitation Overview Bid Timezone: Central Time Start Date: 01/14/ :00:00 Offer Due Date : 01/20/ :00:00 Opening date: 01/20/ :00:00 Invitation Type : Definite Delivery Additional requested information: Tendering text - Header : FROZEN BEEF PRODUCTS, NO: The U.S. Department of Agriculture (USDA) invites offers to sell frozen beef products pursuant to the AMS Master Solicitation for use in the National School Lunch Program and other Federal food and nutrition assistance programs. Acceptances will be announced no later than midnight, January 26, Deliveries are to be made from March 1 to March 31, This solicitation is subject to 8(a) offerings. 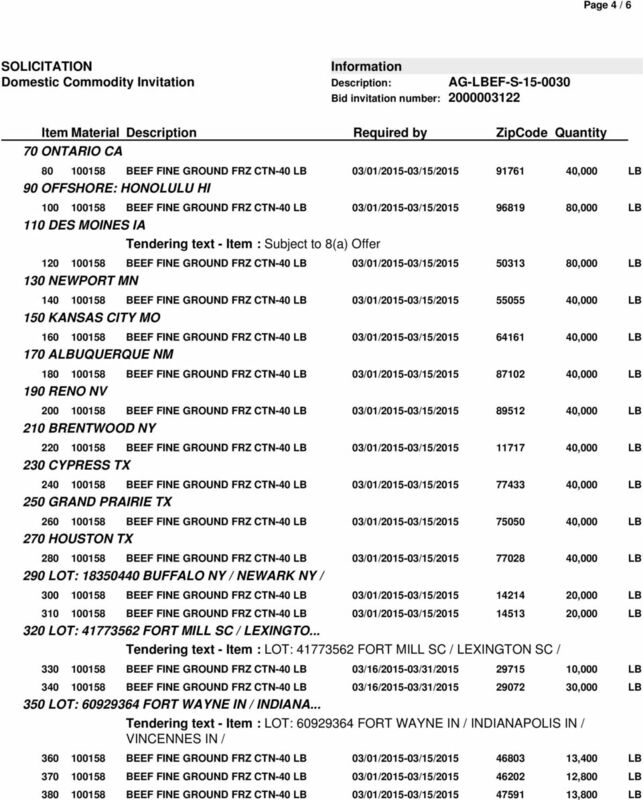 Material is hundred percent (100%) Small Business Set Aside - See FAR Notice of Small Business Set-Aside. NAICS Code Business size 500 employees or less apply to this requirement. Material is a fifty percent (50%) Small Business Set-Aside. Material is ten percent (10%) Service Disabled Veteran Owned Small Business Set Aside. The Solicitation may show multiple stops on some line items, however, the number of stops will be limited to a maximum of three. 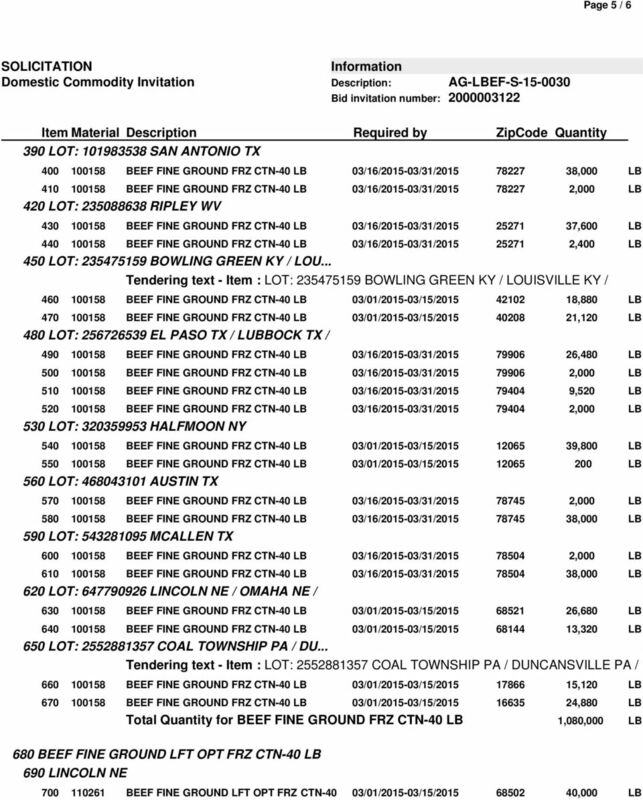 To determine the number of destinations review the "Tendering Text" for the lot, which will indicate the City and State for each stop. 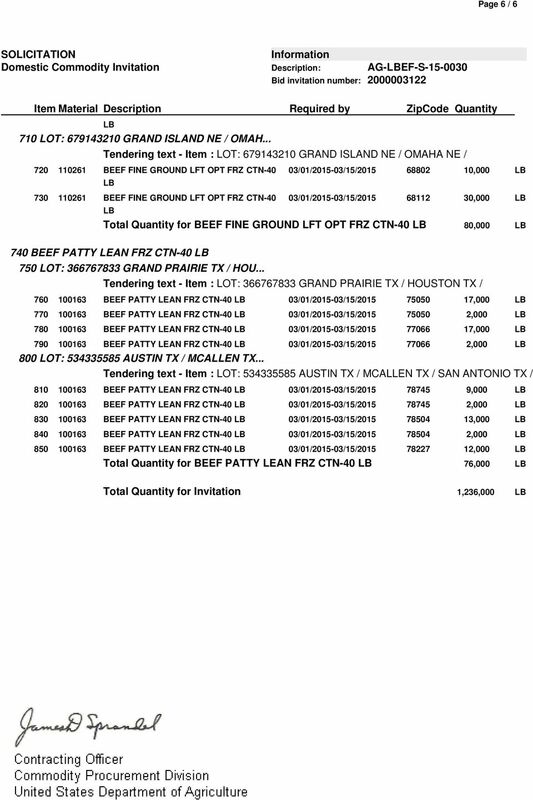 Bidders may submit different prices for each stop. However, a price is required on all line items within the lot. 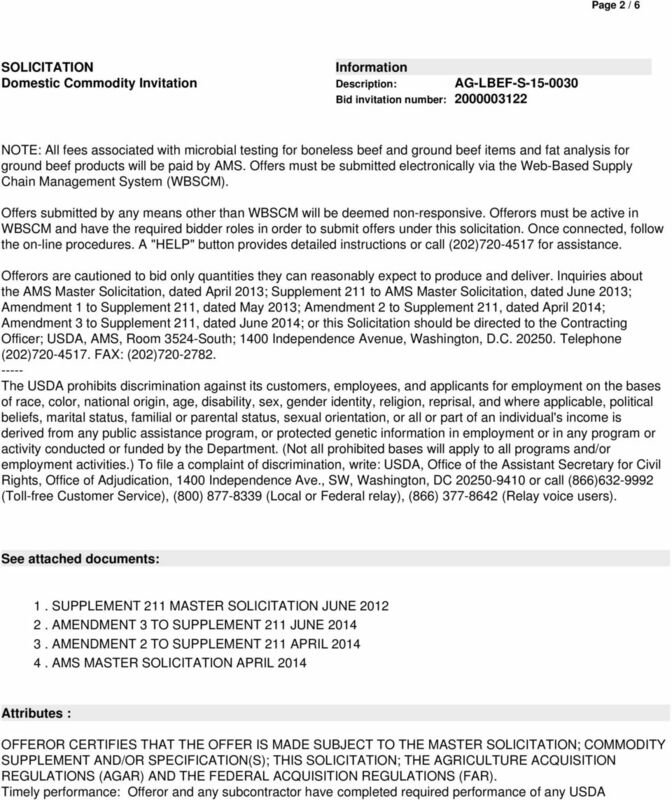 Offerors who intend to use more than one processing plant and shipping point for contracts awarded under this solicitation, other than the processing plant and shipping point entered in their bids, may submit a list of their approved processing plants and shipping points on a separate sheet of paper to be uploaded in WBSCM, and to be submitted with their bids. For offshore destinations (Puerto Rico, Hawaii, etc. ), offerors have the option to choose to enter their bids direct to the offshore destination or to the port. Purchases will be made on an f.o.b. destination basis to cities on this Solicitation. Destination quantities listed are estimates and subject to adjustment based on offerings, changes in recipient needs, market conditions, and program operations. All prime vendors are reminded that they are prohibited from subcontracting with companies or individuals that have been suspended or debarred. In order to submit offers on this Solicitation, Offerors must be deemed eligible by the Contracting Officer. 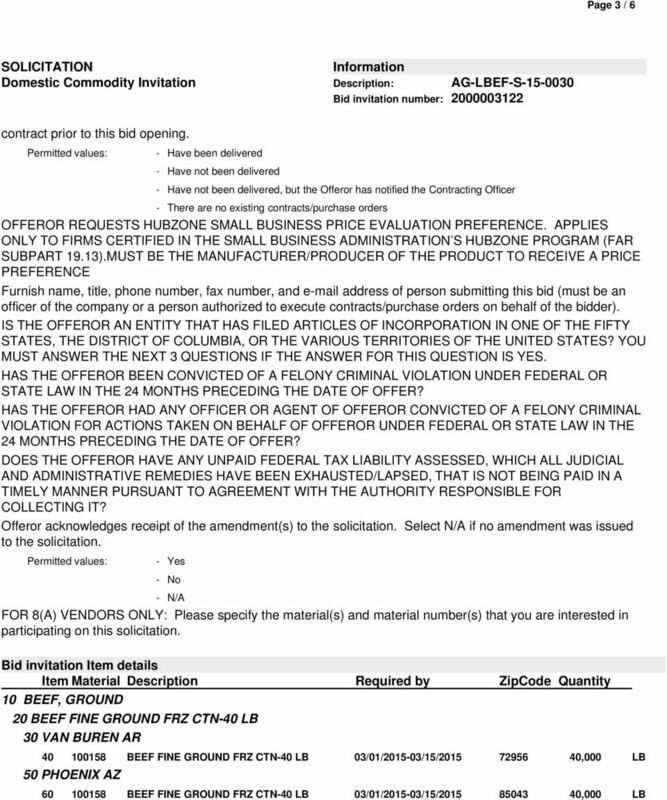 Product purchased under this Solicitation will be produced according to the applicable Federal Purchase Program Specification and eligible supplier's approved technical proposal. Offerors must reference their AMS designated laboratory in their technical proposal. For this solicitation, Hominy Can-24/300 is to be WHITE HOMINY, in accordance with the Commodity Specification. Surety Bond Guarantee Program for Small Businesses USDOE 15 Small Business Forum & Expo What Have You Heard about SBA? SBA requires too much paperwork. ü Now only two forms required from small businesses! 5% to 21%. This APR varies by state. Please refer to Section 3 for details.